Lake Mburo National Park Uganda is situated in western Uganda in Mbarara and Kiruhura districts. Lake Mburo National Park is about 57km from Mbarara the main city near the park and a drive to the park takes about 1 hour. While coming from Kampala, the park is approximately 228km and driving to the park from Kampala is about 4 hours if you are driving to park without any stop overs. Lake Mburo National Park is the nearest park from Kampala of all parks in Uganda. This 5 Days Uganda safari takes you through several the leading safari places in Uganda including the famous home of the endangered mountain gorillas left in the whole world Bwindi Impenetrable National Park, Lake Bunyonyi also known as Africa’s second deepest and Lake Mburo National Park, the nearest national park of all national parks in Uganda. You will engage in several adventure activities including gorilla tracking, game viewing, nature walks etc. Day 1: Transfer from Kampala to Bwindi Impenetrable National Park. Day 2: Do mountain gorilla trekking in Bwindi Impenetrable Forest. Day 4: Transfer from Lake Bunyonyi to Lake Mburo National Park. Day 5: Do morning game drive in Lake Mburo National Park and Return to Kampala. Day 1 of the 5 Days Bwindi gorilla safari and Lake Mburo National Park Uganda wildlife safari tour: Transfer from Kampala to Bwindi Impenetrable National Park with en route at the equator and lunch in Mbarara. You will be picked up from your hotel early in the morning after your breakfast at your hotel by your driver guide on your safari Uganda. He will give you a short safari briefing about your 5 Days Bwindi gorilla safari and Lake Mburo National Park Uganda wildlife safari tour. You will then depart for Bwindi Impenetrable National Park in southwestern Uganda driving a distance of about 492km for about 9-10 hours. You will break your journey with a stopover at the equator in Kayabwe, take some photos, have a polar water experiment as well as visit the souvenir shops around the equator. Retreat and continue to Mbarara where you will have lunch. From there head to Bwindi impenetrable national park the centre of attraction and a distinct feature for Uganda’s tourism. Day 2 of the 5 Days Lake Mburo National Park Uganda wildlife safari tour and Bwindi gorilla safari: Do mountain gorilla trekking in Bwindi Impenetrable Forest. Take an early morning breakfast at the lodge and head to the park office headquarters, carry with you packed lunch for a briefing from the park rangers. The rangers will lead you into the forest using the navigable trails to trek the gorillas in the thick impenetrable Bwindi forest. You get to spend an hour with the gorillas after having trekked for about 3-5 hours. If you are not so worn out in the evening, head for a brief nature walk to the Batwa community. Return to the lodge for dinner and overnight. After your breakfast, say farewell to Uganda’s lovely impenetrable forest and embark on your journey to Lake Bunyonyi a lake that is undeniably amazing. The word Bunyonyi means “small birds” in direct translation which means that the lake is a must stopover for committed birders and besides that its serpentine shape and numerous islands other highlights one must look out for. When you reach do a canoe ride, check out several islands like Bwama Island good for birders or you could take a nature walk helping you to appreciate a variety of small birds. During this boat cruise, you will see quite a number of birds like the grey crowned crane, red-chested sunbirds, and many flycatchers. You may decide to also do cycling or a nature walk around the lake. Day 4 of the 5 Days Lake Mburo National Park Uganda wildlife safari tour and Bwindi gorilla safari: Transfer from Lake Bunyonyi to Lake Mburo National Park. After breakfast, head to the beautiful Lake Mburo National Park; a haven for “impalas” small antelopes and herbivorous are most concentrated in this park of all the Ugandan national Parks. There are also many beautiful impalas after which Kampala; the capital city of Uganda was named. 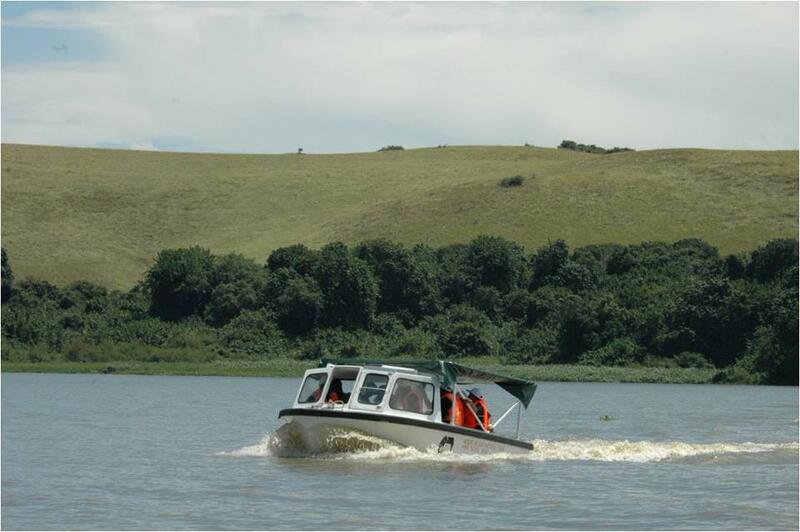 You will do an afternoon boat cruise gaze at the huge hippos, crocodiles and buffaloes as they drink water. There are attractive birds to check out like Abyssinian ground hornbill, the crested crane (Uganda’s national emblem), saddle bill storks among others. 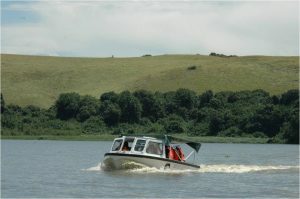 This boat is good for visitors on Uganda birding safaris as well as Uganda wildlife safaris since you get chance to see a lot of birds and animals as they quench their thirst in Lake Mburo. Day 5 of the 5 Days Lake Mburo National Park Uganda wildlife safari tour and Bwindi gorilla safari: Do morning game drive in Lake Mburo National Park and Return to Kampala. Do a game drive and check out Uganda’s wildlife besides the mountain gorillas in Bwindi such as zebra, warthog, buffalo, klipspringer, eland, oribi and waterbuck. 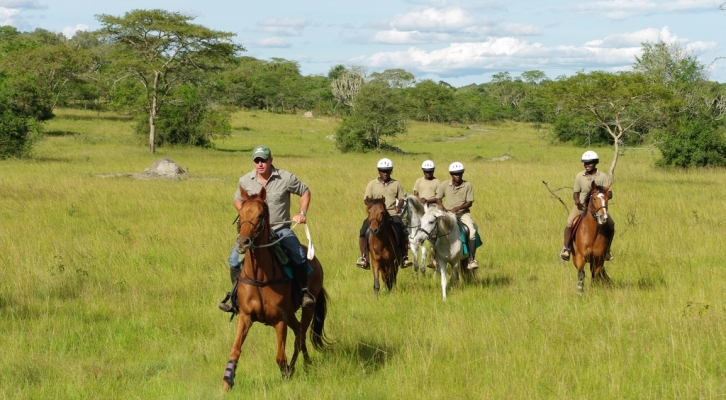 Alternatively, you can do the game drive on ATV quad bikes, in a car and horses as well, the choice is yours. Retreat and drive back to Kampala with a stopover in Mbarara for lunch and take a last gaze at the equator in Masaka leaving you with everlasting memories of the Pearl of Africa, Uganda.